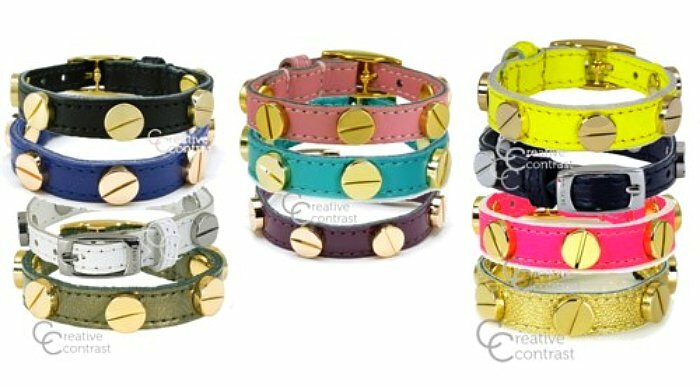 Another few specks of heaven to add to my Spring time wishlist -- CC Skye Screw Bracelets in a myriad of eye candy colours. Considering I've always been a faithful admirer of what's seemingly becoming a timeless trend known as "stackin' up the bangles and cuffs", these precious little buckled bracelets serve as the perfect compliments to my chunkier "wrist bling" accessories. Though it wouldn't please me more than to cop this style in every single available hue, (if I had to narrow it down) my wrists will be undoubtedly transfixed on the fluorescent pink, neon yellow and electric blue gold screw leather cuffs. And, with CC Skye's lovely celebrity following of some of fashion's most style-conscious gals like Rihanna, Miley Cyrus, Leighton Meester, Olivia Palermo (this list can go on and on), it's quite evident just how revered this designer label is fast becoming. Although the current, chilly winter months are still lingering heavily around us, there's no harm in prepping before the warm, cheerier Spring season rolls on in. And though I always have a soft spot for my winter greys, blacks, and taupes, I'm very much looking forward to bangin' out my wardrobe with daring, vibrant colours in the form of aesthetically fresh accessories, frilly dresses, and slightly jeweled footwear. What better way than to start out with a few little heavenly bracelets to add to my jewelry tray? Luckily, my go-to hip spot, Creative Contrast, now has them available in every hue imaginable, and during the month of February, they're offering $5 off any purchase, as well as free shipping on your shopping buys that are over 100 bucks. Just enter promo code VDAY5 at checkout. Not bad indeed. Take a peep! Gorgeous cuffs! Will need to get myself some! These are too adorable. Not always a fan of cuffs but CC Skye does a great job. Love the necklaces from this brand as well!